Honda is one of those great Japanese firms that takes pride in being an engineering company first and foremost. The current 10th generation Civic is a great car, big on space, efficient on fuel yet manages to be fun to drive too. 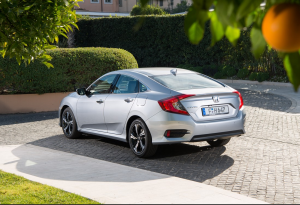 To cash in further on the excellent core product Honda has built a four door version of the Civic. While every carmaker, and I mean every carmaker, seems to be trying to kill of the hatchback in favour of SUVs. The poor old sedan body-form or saloon as we say in Ireland is under even more threat. Does the Civic ‘sedan’ stand a chance, you wouldn’t think so. The four door front wheel drive is a handsome well proportioned car. 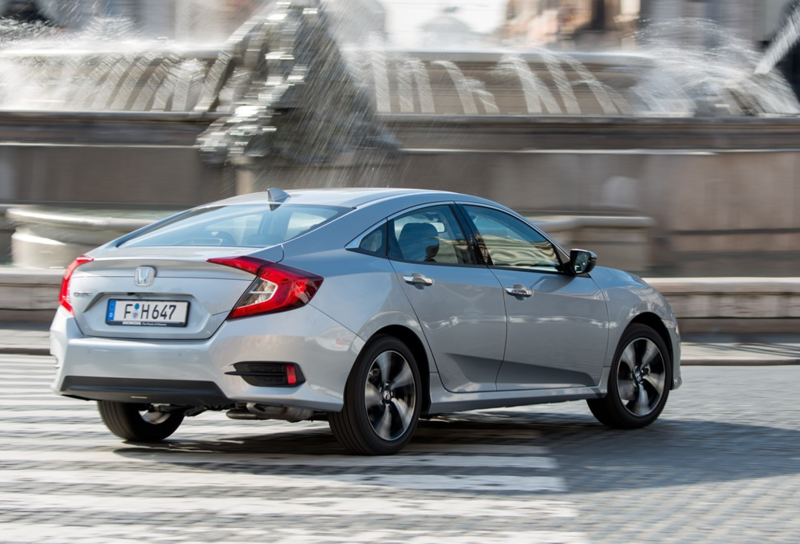 Compared to the old Civic four door, Civic is wider (+46mm), lower (-20mm) and 74mm longer. 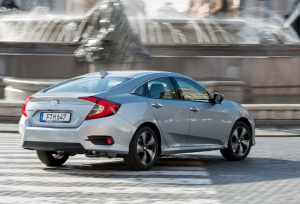 The front end is smart and looks technical, while side-on the Civic looks quite substantial. The rear features a Ford Mondeo/Hyundai i40 like notchback. This comparison to a car class above the compact family car class is no accident as the Civic sedan could easily carry a Honda Accord badge and no one would bat an eyelid. The sleek styling has another benefit, low aerodynamic drag – even the wheels were designed to reduce drag. Inside the cabin the driver sits low, just like the car sits low on the road, although of course you can adjust the seat height. The cabin is a very spacious area when you consider this is a C segment car. The dash is from the hatchback’s and as such features some hard plastics here and there. The rear space is impressive for passengers and there is plenty of head and legroom. Boot space is 519 litres (20.6% larger than before) and the rear seats split 60/40. 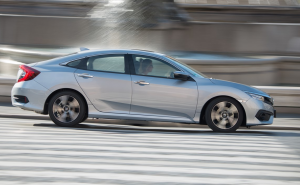 Honda Sensing, its excellent suite of driver safety aids and electronic systems, is standard. This is a great contribution to road safety from Honda. Quite a few rivals offer similar potentially life saving technologies as cost options. Connectivity is right up there with the best in class. Petrol and diesel engines are available. 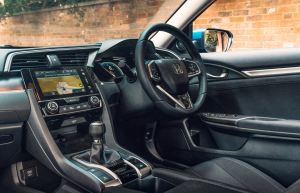 A three cylinder 1 litre VTEC turbo charged petrol with 129hp and 200nm of torque is the quietest option and ideal for lower mileage users. The diesel option is a 1.6 litre i-DTEC four cylinder that is brilliant. It has plenty of poke, while 120hp doesn’t seem that high a figure it has impressive pulling power with 300nm of torque. This power delivers effortless cruising and the diesel is very frugal too returning low fuel consumption figures and subsequently low CO2 emissions (91g/km). I average 4.9l/100km without trying during my test driving. 0-100 km/h takes 10.5 and is delivered through the standard fit manual six-speed gearbox. The gear lever is set nice and high in the console like a touring car. A nine-speed auto is available with the diesel and a simulated seven-speed CVT available with the petrol engine. 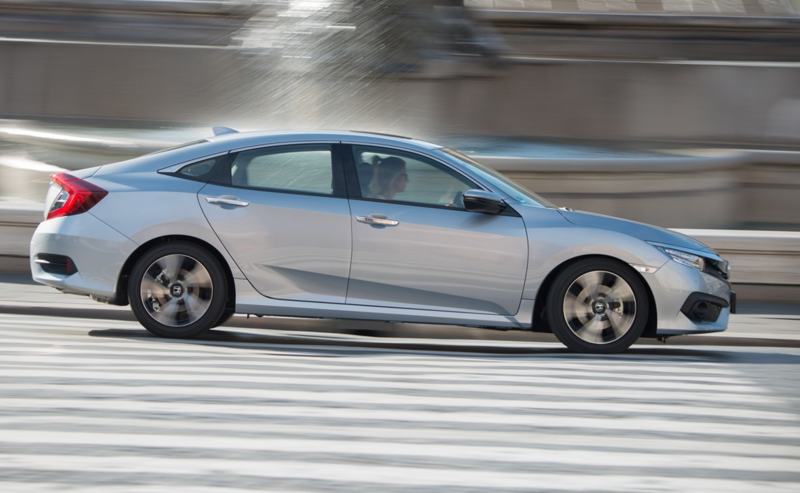 On the road the Civic saloon is composed and nice to drive. MacPherson front suspension up front and a rear multi-link suspension set up at the back delivers a sophisticated ride quality. 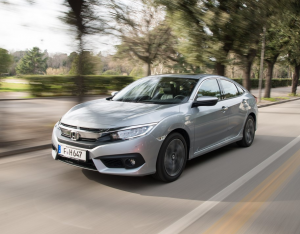 Honda Civic Saloon prices start from €1,000 more than the hatch at €24,750 for the petrol model and €26,550 for diesel. There are three grades Smart, Smart Plus and Premium. 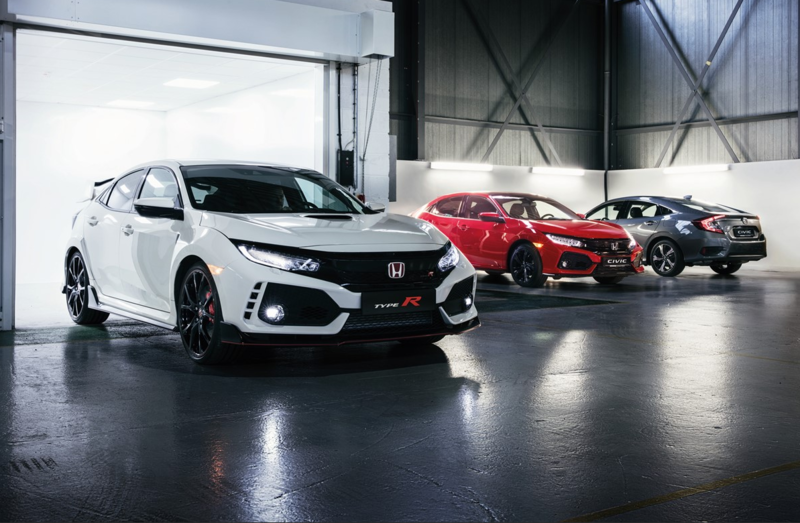 The Honda Civic sedan joins an impressive Civic line up that includes the bonkers TypeR. The Sedan is proof that there is still life in the four door sector.